We know that you don’t get a lot of guarantees in life, but Ameritex Houston Movers‘ Stress-Free Move Guarantee is one you can count on. Ameritex is not like a lot of other moving companies just trying to make a quick buck. Instead, we are simply humans helping humans. Moving is a stressful, emotional experience, and we are Houston movers who care. We strive to make your move quick, safe, and problem free. On top of that, we always promise to conduct ourselves responsibly. When you hire us, you receive prompt, professional and qualified moving crews who are happy to help deliver a Stress-Free Move. You can always rely on us for our Stress-Free Move Guarantee. 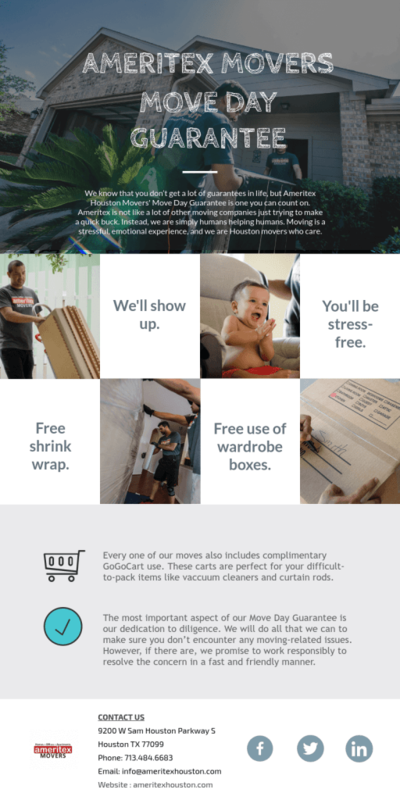 Find out what else you can expect from our local moving company. Being on time is important to us, and our goal is to keep your moving day on schedule. That is why we guarantee to load and deliver your items on time on your requested moving date. If we have to reschedule your service due to mechanical failure, we pay you. Please note that this offer does not apply to delays related to weather, traffic, or acts of Mother Nature. Some restrictions apply. Ask for details. We offer to wrap your furniture pieces with durable, double-quilted, waterproof furniture pads. Plus, we also provide you with Free Shrink Wrap to help secure and protect your furniture. Easily transport your clothing from your old closet to your new one with our wardrobe boxes. We offer the complimentary use of three wardrobe boxes during each move. Each wardrobe box fits 3 to 5 feet of clothing (based on the bulkiness). And, you can use the bottom portion of the box to transport hats, belts, shoes, purses, and more. Each customer gets to use a GoGo Cart for free during the move. The carts are triple-ply durable corrugated boxes that are approximately 4 feet by 3 feet. Your moving crew will use this huge open-topped box to quickly and efficiently transport those hard-to-pack and time-consuming items. Say hello to the solution for your vacuum cleaners, curtain rods, large pictures, and more. We will safely and efficiently load your goods onto our moving trucks at origin, then transport your goods to your destination. After that, we’ll unload and setup your goods wherever you want them. The most important aspect of our Move Day Guarantee is our dedication to diligence. We will do all that we can to make sure you don’t encounter any moving-related issues. However, if there are, we promise to work responsibly to resolve the concern in a fast and friendly manner. Give us a call today to schedule your next Houston move.